With the Red Line South Branch closing May 19 through at least October, the CTA plans to divert much of its commuter traffic to the Green Line -- creating mixed opinions among several commuters interviewed who take both trains regularly. 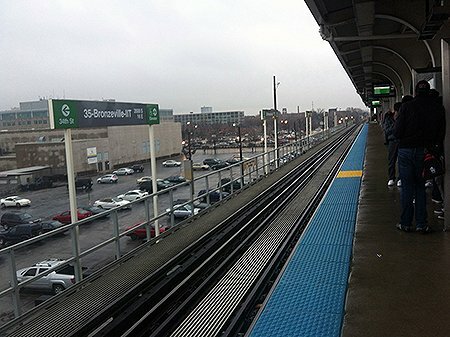 The CTA plan calls for Red Line trains to run on the elevated Green Line tracks between the Ashland/63rd and Roosevelt stations. The agency has already started the process of renovating and adding new features to Green Line stations, such as cameras and bus shelters for shuttles coming from the Red Line’s most southern stations. According to the CTA, the expected ridership on the Green Line is expected to go up from 15,000 to 50,000 during the Red Line construction. Stephanie Berryhill, 20, a DePaul junior who makes the Red Line commute on a daily basis from her home in Englewood, will be one of those commuters that will have to rely on the Green Line service. Berryhill also expressed some concerns about safety during the construction period. Berryhill will not be alone during the transition period. According to the CTA’s website, the construction will affect about 80,000 commuters that rely on the South Branch each day. Ken Bigger, a Hyde Park resident and an administrator for the Illinois Institute of Technology, used to be a Red Line commuter but has opted to take the Green Line because it is less crowded. Now, Bigger will have to deal with crowded trains once more. With the average ride costing $2.25 each way and 50 cents for transfers, the CTA has been an economical and reliable transportation alternative to commuters. With the upcoming changes, some of them might have to seek more expensive alternatives. Jill Ibach, a DePaul senior and Bronzeville resident, makes the commute to the Loop and Lincoln Park campuses at least three times per week. Now that Green Line trains are going to be crowded, she is thinking of using alternative methods of transportation. However, there are some Green Line commuters who have agreed that these changes are necessary and are willing to stick with their regular plan, no matter what. Chuck Levesque, a Woodlawn resident and a social worker for DePaulUSA, a homeless service agency, makes his daily, roundtrip work commute from Cottage Grove. Like others, he has prepared himself in advance and is ready for the changes. How will closing impact the White Sox, attendance?